You ever have one of those weeks where everything happened at once? Yeah, me too. I finished my final group project, which consisted of a 40-page report and a 35-minute presentation, the final grade of my master’s degree. When it was over, I drove straight home, put on pajamas, turned on the TV, plopped into Robby’s recliner and sat there with a bowl of grapes (I won’t tell you for how long). I cut my hair. My coworker has a quote by her desk by Coco Chanel, “The woman who cuts her hair is about to change her life,” and despite the fact that I’ve cut my hair in this way before, it does feel momentous. We prepared to host family for the first time in our married life, which meant planning food and entertainment for more humans AND cleaning [the whole] parts of the house. Bear & Bug Eats got its first sponsorship opportunity! I heard a podcast a couple of months ago where another food blogger mentioned conferences as being key to helping her launch her brand. I did some casual googling and found one in Orlando! From their website, “The Food Wine Conference brings together bloggers, small business owners, winemakers, chefs, public relations professionals, traditional media, new media, authors and brands.” Basically perfect for me and this young blog. But it cost money, and I’m not making any here yet; and more importantly, I was (and am) still a little terrified. I’ve only been blogging a year! My photos are still poorly lit! My editorial calendar is more like an editorial guideline! I don’t actually know about wine, I’m just borrowing knowledge! I’m not qualified! But. There was a Brand Ambassador program. Last year, about 30 bloggers received a discount to the conference in exchange for promoting the conference and a specific brand on their platforms. The deadline for this year was in two days, so I didn’t have time to think about it. I filled out the application and hit “Send.” I didn’t tell anyone I had applied, but I decided that if I did get accepted, I would take it as a sign. I would do it. I forgot about it when I didn’t hear right back. When I finally checked my email, there were not one, but TWO emails confirming that Bear & Bug Eats had been named a Brand Ambassador! I sat on it for a day or so (that terror again) and then I decided: I’ll have to fake it ’till I make it. I told my husband. I told my friends. I told the community at Food Blogger Pro. I bought my discounted registration and drafted the first promotional social media posts. And I’m announcing it here. Friends, I will be at the Food Wine Conference in Orlando, May 19-21! I’ll be learning about SEO (search engine optimization, a Very Important Bloggy concept), food photography, writing, what to do if you want to write a cookbook, social media…basically everything. And meeting and networking with a few dozen other bloggers, chefs, wine people…basically perfect. If it sounds like something you’ve always wanted to do, registration is still open! Use my code, KatieB2017, and we both get $50 off! Or you can follow my adventures in professional blogging on Facebook / Instagram / Twitter! I do also have a recipe! It being almost Cinco de Mayo, I have a themed recipe! Hint: it goes fabulously with blackened chicken or fish. As with my Perfect Guacamole, this Mango Salsa is just a handful of ingredients. Simple, and better for being so. I wasn’t sure about the salt at first, but it’s what makes this work. 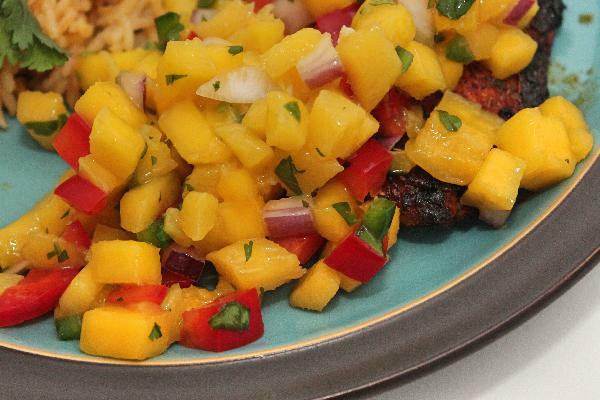 Mango, even juicy mango, doesn’t squoosh as much as tomatoes do in a traditional salsa. The salt works while the salsa chills, drawing out the flavors and mingling them together to create just a little juiciness. I had some trouble selecting and cutting mangoes at first, but I think I’ve got a hold on it now. How about some tips? A ripe mango has about the same amount of give as a ripe avocado. If you don’t buy a lot of avocados, that might not be helpful, so instead: you want mangoes, and avocados, to be a little soft. If you were to dig a thumb into one, you’d leave a dent (don’t actually dent produce before you buy it. Rude). But you also don’t want it so soft that you can feel it squish under your fingers. Also, if you smell the stem end, you should get a big whiff of that sweet, distinctive ripe-mango scent. If it doesn’t smell like a perfect mango, it won’t taste like one either (if you don’t know what a perfect mango tastes like, then it’s time you ate more of them). Like avocados, mangoes will ripen on the counter if you buy them a little too early. Cutting into a mango is also a bit of an adventure. They have one really giant, flat pit in the middle that’s nothing like any other fruit I’ve encountered. There are two ways to cut around this. The first involves cutting off the “cheeks,” scoring the flesh, and turning the skin inside out (see this tutorial from Gimme Some Oven for visuals). This great for snacking, but not great for small dice. What I did instead was to peel the mangoes with a vegetable peeler, THEN cut off the cheeks. I was left with two pre-peeled pieces that could be chopped and diced just like any other produce (a la this tutorial from Serious Eats). I served this for dinner over blackened chicken, but there’s nothing wrong with eating this with good old tortilla chips. In fact, if serving the salsa with dinner is your plan, better not have any tortilla chips in the house while the salsa chills. Don’t say I didn’t warn you. Perfect Mango Salsa! A handful of ingredients + quick prep = the perfect topping for blackened fish or chicken, or a fabulous healthy snack. Mix all ingredients together. Allow to sit for at least 30 minutes (2+ hours if you have them) before serving. Congrats on your master’s degree! We are going to have a BLAST at Food Wine Conference!! Thanks, Betsy! Can’t wait to meet you!